6. Payments and Performance. Tenant agrees to pay all rents and sums provided to be paid by Tenant pursuant to this Lease at the times and in the manner herein provided, without any setoff, deduction or counterclaim whatsoever. Should this Lease commence on a day other than the first day of a calendar month or terminate on a day other than the last day of a calendar month, the rent for such partial month shall be proportionately reduced. The Base Rental for the first partial month, if any, shall be payable at the beginning of said period or as Prepaid Rental. The obligation of Tenant to pay rentals is an independent covenant, and no act or circumstance whatsoever, whether such act or circumstance constitutes a breach of covenant by Landlord or not, shall release Tenant from the obligation to pay rentals. Time is of the essence in the performance of all of Tenant's obligations hereunder. In the event any rental is not received within ten (10) days after its due date for any reason whatsoever, or if any rental payment is by check which is returned for insufficient funds, then in addition to the past due amount Tenant shall pay to Landlord a late charge in an amount equal to five percent (5%) of the rental then due, in order to compensate Landlord for its administrative and other overhead expenses. Any such late charge shall be payable on demand as additional rental. In addition, if rental is paid by a check which is returned for insufficient funds, Tenant shall immediately make the required payment to Landlord in good funds; moreover, in such event Tenant shall also pay to Landlord not only the late charge specified above in this Paragraph 6 (i.e., if and to the extent that such dishonored check causes the rental to become past due by more than ten days), but also an additional fee of $___ to compensate Landlord for its expense and effort in connection with the dishonored check. 7. Installation of Improvements; ADA Compliance. All improvements to be installed in the Premises at the commencement of this Lease shall be installed as specified in the Leasehold Improvements Agreement attached hereto as Exhibit D and made a part hereof. Tenant will assure that the plans and specifications for its improvements, as well as its business operations within the Premises, comply with the Americans With Disabilities Act of 1990, as amended, and all related state and local laws (collectively, the "ADA"); and Landlord agrees that the remainder of the Building, i.e., other than the Premises, shall be in compliance with the ADA. 8. Early Occupancy. 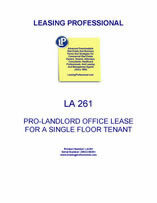 Landlord shall permit Tenant to occupy the Premises prior to the Commencement Date, as soon as the Premises are ready for occupancy (with Landlord hereby assuring Tenant that, subject to Paragraph 39 of this Lease, Landlord anticipates that the Premises will be ready for Tenant's occupancy no later than thirty-five days after the Effective Date of this Lease); and if Tenant so occupies the Premises prior to the Commencement Date, all of the terms and provisions of this Lease other than the obligation to pay rent shall be in full force and effect upon Tenant's early occupancy; however, notwithstanding such early occupancy, the Lease Term shall commence only on the Commencement Date. 9. Limited Right to Calculate Rentable Space; Subsequent Liquidation. (a) Landlord and Tenant agree that at any time within sixty (60) days after the Commencement Date of this Lease, either party may, at its sole expense, employ a licensed architect to calculate the Rentable Space of the Premises and/or of the Building. If the architect performing any such services should issue a written statement within ninety (90) days after the date of this Lease, which indicates that the Rentable Space specified for either the Premises or the Building should be modified (a "Modification Statement"), and if the other party to this Lease agrees with such Modification Statement, then Landlord and Tenant shall execute a written Amendment to Lease confirming the mutually agreed information and the appropriate rental adjustment which results from the corrected information (e.g., increasing or decreasing the Base Rental proportionate with the increase or decrease in the Rentable Space). If the architect performing any such services should issue a Modification Statement within ninety (90) days after the Commencement Date of this Lease, and if the other party to this Lease does not agree with such Modification Statement, then the other party may, at its sole expense, within sixty (60) days after the date of the Modification Statement, employ a licensed architect to review and respond to the Modification Statement (the "Response"). If the two architects fail to reach agreement within thirty (30) days after the date of the Response, then they shall select a third licensed architect (either by agreement between the two architects or, if they fail to agree on the third architect, by requesting that the _________ chapter of the American Institute of Architects provide the third architect), with the fees of the third architect to be shared equally by Landlord and Tenant. Upon agreement between the two architects selected by the parties, or upon the final decision of the third architect, Landlord and Tenant shall execute a written Amendment to Lease confirming the final determination and, if necessary, the appropriate rental adjustment. (b) Notwithstanding anything contained in this Lease to the contrary, both Landlord and Tenant acknowledge and confirm their mutual desire to have all financial obligations under this Lease fixed and liquidated as soon as possible so that they can account for and plan such obligations with greater certainty. Accordingly, the parties agree that if neither party employs a licensed architect to perform any of the above-listed services within sixty (60) days after the Commencement Date of this Lease, or if no Modification Statement is delivered within ninety (90) days after the Commencement Date of this Lease, then the provisions of Paragraph 9(a) shall be null and void and of no further force or effect; and in such event (i) so that both parties to this Lease can be assured that they will not have to expend monies for professional fees regarding Rentable Space determinations after the deadlines established in Paragraph 9(a), they hereby agree that the Rentable Space for the Premises and for the Building, as specified in Paragraph 1(c) above, shall conclusively be deemed to be applicable to this Lease; and (ii) so that both parties to this Lease can be assured as to their financial obligations after the deadlines established in Paragraph 9(a), they further agree that Base Rental, the Allowance, rental adjustments and all other aspects of this Lease which are based in whole or in part upon Rentable Space shall be deemed to be liquidated and no longer subject to adjustment based upon inaccuracies and/or errors, if any, in the Rentable Space determinations specified in Paragraph 1(c). 10. Repairs and Reentry. Tenant will, at Tenant's own cost and expense, maintain and keep the Premises and any alterations and additions thereto in sound condition and good repair, and shall pay for the repair of any damage or injury done to the Building or any part thereof by Tenant or Tenant's agents, employees and invitees; provided, however, that Tenant shall make no repairs to the Premises without the prior written consent of Landlord. The performance by Tenant of its obligation to maintain and make repairs shall be conducted only by contractors approved by Landlord after plans and specifications have been approved by Landlord. Tenant will not commit or allow any waste or damage to be committed on any portion of the Premises, and upon the termination of this Lease by lapse of time or otherwise, Tenant shall deliver up the Premises to Landlord in as good condition as at date of possession, ordinary wear and tear excepted. Upon such termination of this Lease, Landlord shall have the right to reenter and resume possession of the Premises. Notwithstanding the foregoing provisions of this Paragraph 10, any repairs to the Premises or the Building that are necessitated because of any damage caused by fire or other casualty shall be governed by the provisions of Paragraph 18 below. Landlord shall be responsible for maintenance to the exterior, structural and common areas of the Building. 11. Alterations and Additions by Tenant; Security System; Rooftop Satellite Dish. (a) Tenant shall make no alterations in or additions to the Premises without the prior written consent of Landlord (which Landlord agrees it will not unreasonably withhold as long as Tenant describes the requested alterations or additions with reasonable specificity). If and upon Landlord's approval of same, all alterations and additions to the Premises will be performed by Tenant at Tenant's cost and expense. All alterations, additions, and improvements made to or fixtures or improvements placed in or upon the Premises by either party (except only moveable trade fixtures of Tenant) shall be deemed a part of the Building and the property of the Landlord at the time they are placed in or upon the Premises, and they shall remain upon and be surrendered with the Premises as a part thereof at the termination of this Lease, unless Landlord shall elect otherwise, whether such termination shall occur by the lapse of time or otherwise. In the event Landlord shall elect that certain alterations, additions and improvements made by Tenant in the Premises shall be removed by Tenant, Tenant shall remove them and Tenant shall restore the Premises to its original condition, at Tenant's own cost and expense, prior to the termination of the Lease Term. (b) The parties contemplate that Tenant will wish to install its own security system for the Premises (but not extending to any other portions of the Building other than the Premises). Tenant shall have the right to install its own security system for the Premises after obtaining the prior written consent of Landlord for the type of equipment and manner of installation; and in this regard Landlord agrees that its consent not to be unreasonably withheld or delayed. (c) Tenant shall have the nonexclusive right to install, operate, and maintain a single satellite dish and related equipment (the "Satellite Equipment") in an area on the roof designated by Landlord (the "Roof Space"), to use solely in connection with Tenant's business in the Premises. In conjunction with Tenant's right to use Roof Space, as provided in the immediately preceding sentence, Tenant shall also have the right to install and maintain associated wiring from the Premises to the Satellite Equipment on the Roof Space through parts of the Building not leased to Tenant. Tenant shall assure that its Satellite Equipment does not interfere with other equipment currently located on the roof of the Building. In addition, none of Tenant's installations or equipment may be visible at the ground level in the vicinity of the Building; however, Tenant may install visual barriers around the Satellite Equipment, consistent in appearance with a first-class office building, that are seen from the ground level in the vicinity of the Building. Tenant shall have access to the roof and Tenant's equipment relating to the Satellite Equipment at all times throughout the Lease Term; moreover, Tenant at its option and at its sole expense may install security fencing around its Satellite Equipment provided that Tenant receives Landlord's prior approval for the plans and specifications with respect thereto (not to be unreasonably withheld or delayed). Tenant's Satellite Equipment, and the associated wiring thereto, shall be installed in accordance with all applicable laws and regulations, as well as plans and specification approved by Landlord (which approval shall not be unreasonably withheld or delayed), by contractors selected and employed by Tenant. All work relating to the Satellite Equipment shall be coordinated with Landlord's roofing contractor so as not to adversely affect any warranties in respect of the roof . The maintenance and operation of Tenant's Satellite Equipment shall be accomplished at Tenant's expense by Tenant or contractors selected and employed by Tenant. Any Satellite Equipment installed on the roof by Tenant and any connecting wiring to the Premises shall remain Tenant's property notwithstanding attachment to the Building, may be removed by Tenant at any time, and shall be removed by Tenant at the conclusion of the Lease Term (i.e., with Tenant restoring any damage to the Roof Space, or elsewhere in or on the Building, which may have been caused by the installation or its removal). 12. Entry for Repairs and Inspection. Landlord and its agents and representatives shall have the right to enter into and upon any and all parts of the Premises at all reasonable hours (or, in any emergency, at any hour) to inspect same or clean or make repairs or alterations or additions as Landlord may deem necessary, and Tenant shall not be entitled to any abatement or reduction of rent by reason thereof. During the period of one hundred (180) days prior to the expiration date of this Lease, Landlord and Landlord's agents may exhibit the Premises to prospective tenants at reasonable hours and upon prior notice to Tenant.